Late last March it was announced that the Cardfight!! 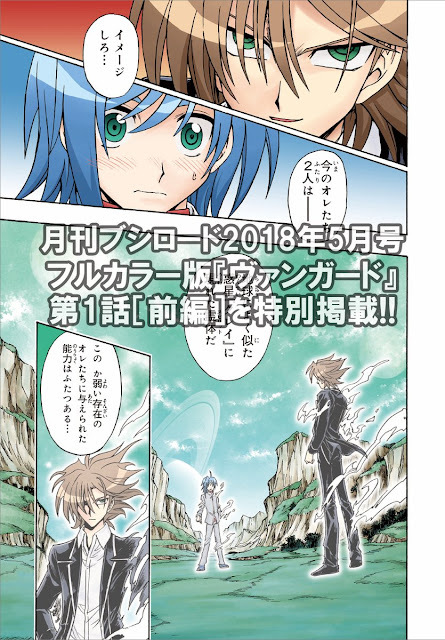 Vanguard manga is being re-serialized in Monthly Bushiroad magazine in colorized form. The series' concept creator and manga author Itou Akira is doing the color work himself, expanding on several one-shot colorizations he had done back during its original 2011-2017 run. Monthly Bushiroad tweeted several preview images of the first color chapter, which debuts in the latest issue. Chapter 1 will span 48 pages in total. 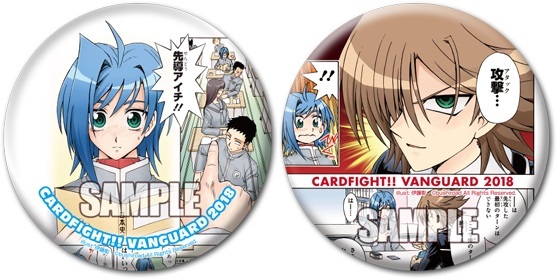 Fans will be able to purchase a pair of pins based on the manga panels at this year's Vanguard Festival in Japan. Aichi's badge will be for sale on day 1 of the event on April 29th, and Kai's badge on day 2 of the event on April 30th. The Cardfight!! Vanguard manga's international license is currently held by Vertical Inc., who is in the process of localizing volume 12, due out July 24th. No international plans for the color edition have been announced as of yet. 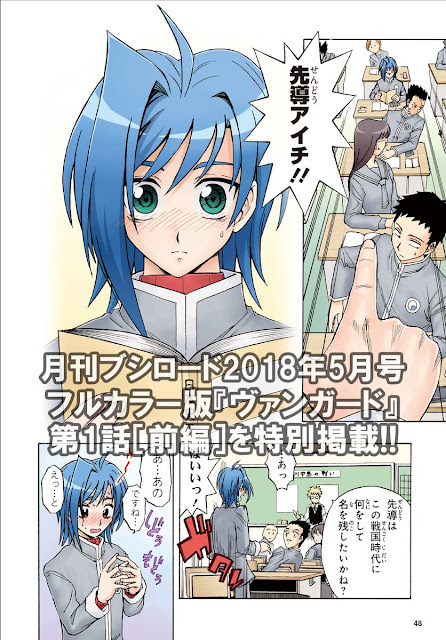 The new anime series based on the manga, codenamed "Origin," will begin airing May 5th, 2018, on TV Tokyo and affiliated stations. It will be simulcast with English subtitles on YouTube and Crunchyroll, and unlike past seasons will be in a late night to early morning timeslot. 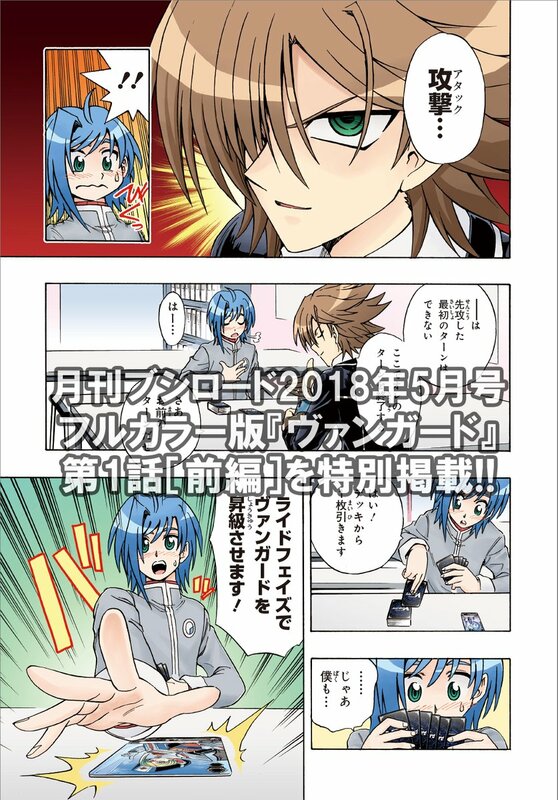 V-Trial Deck 01: Sendou Aichi and V-TD02: Kai Toshiki will launch in Japanese May 11th, 2018, and in English June 8th, 2018. V-BT01: UNITE! TEAM Q4! will launch in Japan May 25th, 2018, and in English June 22nd, 2018. he first Extra Booster set, V-EB01: The Destructive Roar will launch in Japan June 29th, 2018, and in July for the English-speaking world.